AutoCAD is a 3D computer-assisted design software by Autodesk that’s created for manufacturing planning, product designing, building designing, construction, and civil engineering. More than making 3D models, AutoCAD is also used for drafts, documents, and 2D drawings. The 2D drawing, annotation features, and drafting allow users to customize texts, add dimension styles, tie in data from Microsoft Excel tables and spreadsheets to the drawings, and use dynamic blocks. On the side of 3D modeling and drawing, users can apply lighting and add materials to the models to produce real-life renditions and appearances. Edges, shading, and lighting can also be controlled for the models in AutoCAD. The app also allows users to look into the interior of their 3D creations. AutoCAD allows them to take data from PDF files to work with teammates as drawings and models are reviewed. Lastly, interface customization is also possible to make model editing faster and to organize the AutoCAD tools for easier access. AutoCAD has the goal of assisting users to design and prototype essential product parts like a wind turbine, aircraft, and car components. Additionally, this app assists in designing buildings, showcasing of sustainable and flexible infrastructure projects, handling of construction costs, and forecasting of project outcomes. To accomplish this, the 3D CAD app provides visualization and 3D modeling tools. One 3D CAD program allows users to add a myriad of 3D modeling styles and techniques to make real-looking models of products and its parts. The app also allows creating 3D solids, surfaces, meshes, and wireframes. On creating photorealistic renders of 3D models, AutoCAD can attach materials to 3D models and even add scene-specific lighting. Controlling the appearance of and lighting on the added materials and shadows of the models is also possible and provides better visualization of the concepts. Another 3D modeling tool in AutoCAD is the ability to make section planes. These planes are for creating cross-sectional views of the 3D models. Modification and adjusting section planes are possible to see the inner parts of 3D objects and allow users to slice through surfaces, solids, regions, and meshes. Moreover, AutoCAD can alter text appearances in 2D drawings. Through changing the text settings, users can change line spacing, font, justification, and even color. Additionally, when text settings are changed, every text object used in the drawing will also automatically follow when the settings are updated. AutoCAD also gives users the ability to change dimension settings such as manipulating the arrowhead style, lateral tolerances, and text location. Making dimension styles and applying them to all dimensions of the drawing is also possible. AutoCAD also has a strong 2D drawing tool that gives users a way to manifest Microsoft Excel spreadsheet and table data to their drawings. Importing data and formulas from Microsoft Excel is also supported. AutoCAD also adjusts the 2D table if the user has updated the Excel file such as adding rows and columns. On the other way around, the spreadsheet will also adjust to the table if it’s adjusted on AutoCAD. On importing and sharing data from PDF files, AutoCAD allows users to apply data from PDFs to their drawings. Importing 2D geometry, images, and TrueType texts is also allowed. 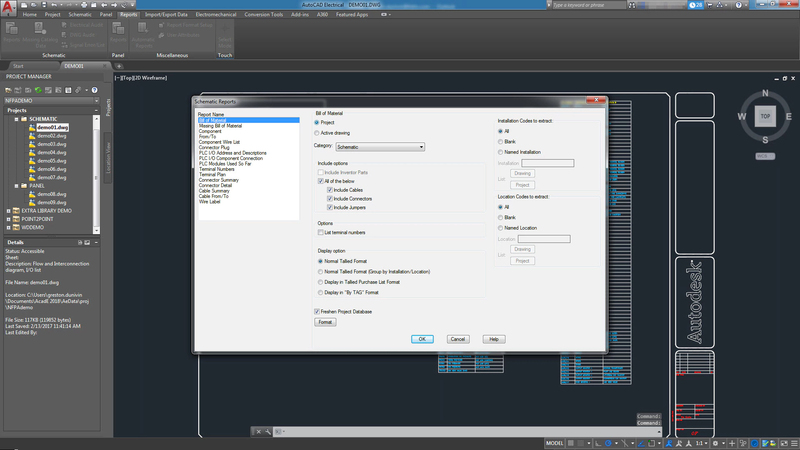 AutoCAD also has the SHF text recognition tool that converts SHF-font text to a text object. The app also presents the PDF import enhancement as SHF texts taken from PDF files made in AutoCAD. As PDF file can’t read SHF fonts properly, the obtained text will have arcs, circles, and lines that are difficult to edit. Using the SHF recognition function, these texts lifted from PDF files are taken as geometries that can be changed to text objects and allowing edits more easily. Lastly, users can take non-Autodesk 3D models to AutoCAD, place geographic points and show online maps in the drawings, and add drawings and images to the AutoCAD drawings as reference points. Aside from its ability to import files from PDFs and Microsoft Office files, AutoCAD is integrated with three business apps and systems namely Navisworks, Bing Maps, and Bentley Systems’ MicroStation. The AutoCAD Mobile app is currently available for both iOS, Android and Windows smartphone.